dark circles, bags and wrinkles. 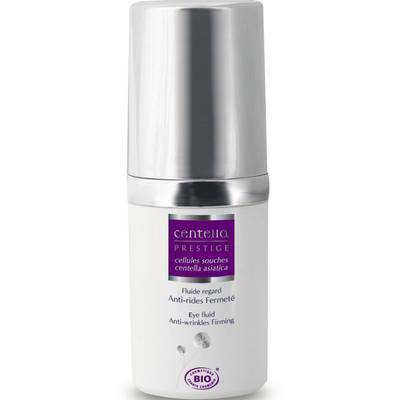 It is recommended to make younger your look thanks to the smoothing, clarifying and firming action of the centella stem sells. Direction for use : Apply morning and/or evening, patting delicately from the internal eye corner to external one insisting especially on the crow's-foot. Aqua, Aloe barbadensis leaf juice*, Glycerin, Sodium hydroxide, Lactic Acid, Centaurea cyanus (Cornflower) flower water*, Chondrus crispus (Carrageenan) extract, Centella asiatica meristem cell culture, Centella asiatica extract*, Trigonella foenum-graecum extract*, Triticum monococcum extract*, Sodium hyaluronate, Arginine, Tocopherol, Benzyl alcohol, Dehydroacetic acid, Xanthan gum, Parfum, Sodium benzoate, Potassium sorbate, Citric acid, Benzyl salicylate, Citronellol, Geraniol, Linalool.